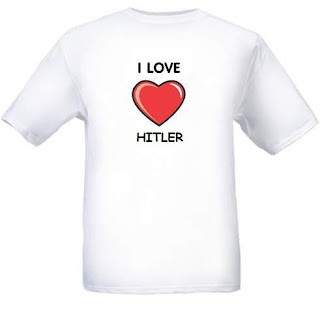 Hitleriffic - More fun than a barrel full of Nazis™: "I Love Hitler," Amazon Doesn't. Amazon deleted the item after protests from the Jewish community. The shirt is still available at shop.com, however. For a mere $16+ shipping, you too can have a pure white t-shirt emblazoned with a red and black logo. These guys will probably protest the shirt as well, but for other reasons.